While Region Eight is mainly involved in mining, the southern sub-region consists of many Amerindian Villages known for their agricultural productivity amidst the challenges of its location. To ensure that a more networked approach is adopted to boost agricultural production and productivity, Agriculture Minister, Noel Holder spearheaded an Outreach to the Region. 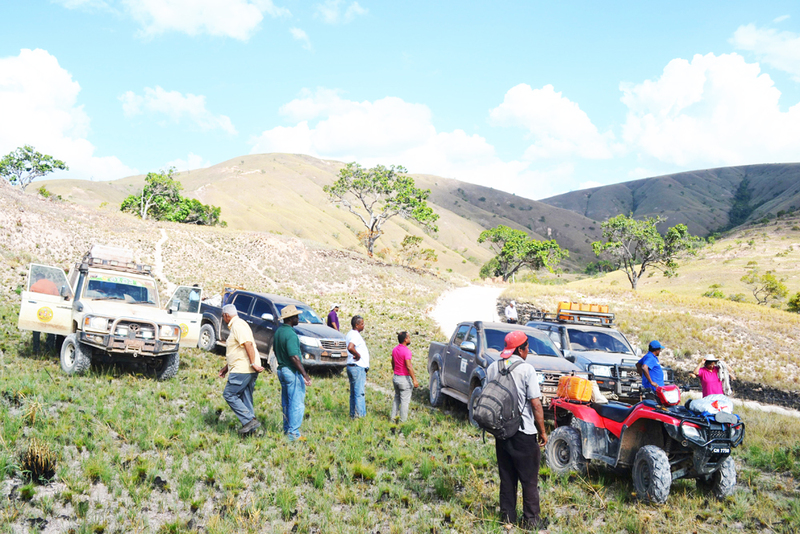 The team in a convoy of five vehicles from various agencies in the Ministry crossed rivers, drove through thick forests, mountains, uphill, downhill and on rugged terrain, made its way to Kanapang, Itabac, Kato and then Tuseneng to meet with resident. At the village, huge yams, cassava and bananas produced by the village were on display. However, the availability of markets was one of the greatest concerns of residents. Guyana Marketing Corporation’s, Corp Extension Officer assigned to the Hinterland, Jo-Lee Walton informed the residents of efforts made by the GMC through the facilitation of produce to markets. She added that while the GMC prefers not to purchase produce from individual buyers, they can offer this facility once the farmers formed themselves into groups/clusters. According to Walton, it takes dedication, partnership and individual effort to ensure success and has committed to working with the villages to ensure that market related issues are addressed. The additional concerns and recommendations, which were raised by residents would be incorporated into the Region’s development programme. The Minister was accompanied by Permanent Secretary, Ms. Delma Nedd; Chief Executive Officers, National Agricultural Research and Extension Institute and National Drainage and Irrigation Authority (NDIA) respectively, Dr. Oudho Homenauth and Mr. Fredrick Flatts; Deputy Chief Executive Officers, Dr. Dwight Waldron; Specialist Hydrologist, Hydromet Department, Ms. Diana Misir; Director of the Agriculture Sector Development Unit, Mr. George Jervis; Senior Inspecting Officer, Pesticide Board, Mr. Michael Ramsammy; and Corp Extension Officer, Guyana Marketing Corporation (GMC), Jo-Lee Walton. The team, visited the villages of Kamana, Kurukabaru, Kanapang, Itabac, Kato, Tuseneng, Paramakatoi, Bamboo Creek, and Monkey Mountain between April 11 and April 15. The villages of Rukumuta, Karasabai, Tiperu and Yurong Paru in Region Nine were also visited. At Kamana, the team was greeted by Toshao Jeffery Edwards and Councillors. The meeting was held at the Community Centre. Issues such as cassava rot due to the flooding the region experienced a few months ago were discussed. 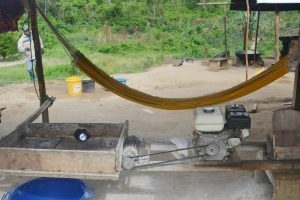 There was also a request for a cassava machine for the community women project. Minister Holder spoke of the Ministry’s Agricultural Development Plan, which will be rolled out for the Region, shortly, and will include the recommendations made by the villages. Crop suitability is a major issued if the region is to effectively tap into its potential and will also be incorporated into the programme. “The development plan, which will be implemented seeks to ensure that you expand not only your traditional commodities, but looking into non-traditional,” the Minister said. The issue of subsistence farmers was also addressed as the Agriculture Minister spoke of the potential of the region to become a major exporter to the coast and beyond. He added that while cattle rearing and cassava production are the main income generating product of the region at the moment, the Developmental plan will cater for additional crops and livestock. The Guyana Livestock Development Authority’s Black Giant Poultry programme will now be extended to Region Eight. Deputy Chief Executive Officer, Guyana Livestock Development Authority, Dr. Dwight Waldron, spoke of the potential the programme. Permanent Secretary of the Ministry of Agriculture, Delma Nedd said that the poultry reared could earn revenue for the village. The meat could be sold to the Education Ministry to supplement the school feeding programme. The residents were also encouraged to work along with the extension officers of the National Agricultural Research and Extension Institute (NAREI) in embarking on new crop production. Similar issues were raised at Kurukabaru with residents requesting assistance with aquaculture production. 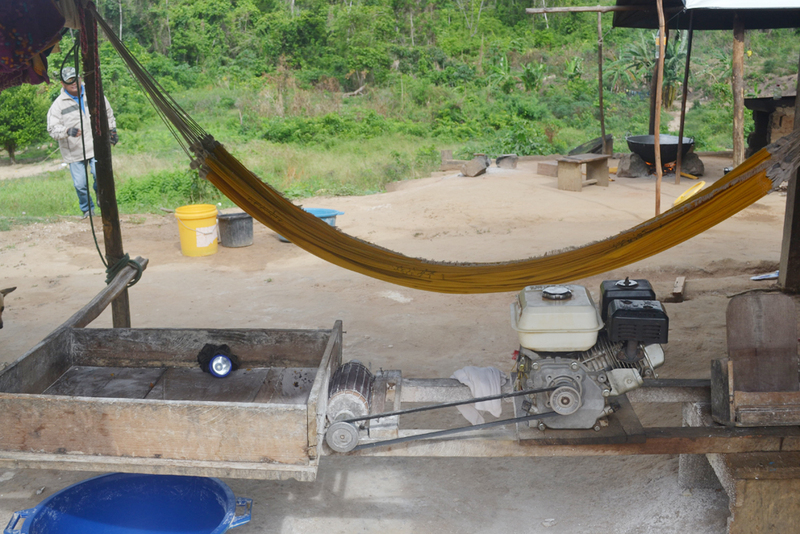 According to Village Councilor, Kurukabaru, Mr. Grandville Lewis, the village is looking into fish rearing. There is a request for technical support from the Fisheries Department. The aim is not only to sell the fish to the village but with the addition of other critical services, to supply other villages and even extra regionally. The National Agricultural Research and Extension Institute (NAREI) has been running a successful ants programme in the region which has since seen the reduction of the prevalence of Acoushi Ants on farms. According to the residents, while this has been of great assistance, they are now affected by white flies and caterpillars. Chief Executive Officer of the Institute, Dr. Oudho Homenauth, who handed over Acoushi Ant bait and chemicals to treat the white flies and caterpillars spoke of the upcoming projects of the Institute. These would be rolled out during the Ministry’s Agricultural Development Plan. “This will see our extension officers working with you to incorporate new crops, and to ensure that pest and diseases do not adversely affect your production. Our team is here to work with you on a day-to-day basis and I urge you to ensure that you are actively involved in ensuring that it is done and in a timely manner,” he said. Similar sustainable development plans will be employed in other hinterland regions according to the Agriculture Minister, who stated that the visit has enabled the team to have a better understanding of the concerns affecting the residents and to ensure that the issues raised were addressed. Recognizing the difficulties posed with respect to access to markets, availability of quality seeds and transportation of production, Government is committed and has embarked on several programmes to help farmers move into new crops. “The developmental Programme will provide sufficient resources so that you can transform your village. With the discovery of Oil and the thrust of the Ministry of Agriculture in moving our production base to the hinterland, the timing is right for investments in agriculture and for you to adopt new and innovative projects,” the Minister said. With the addition of new crops, water management will be crucial and the National Drainage and Irrigation Authority (NDIA) has been mandate to complete a study of the region, which will include the availability of water catchment areas to supply farmers’ irrigation requirements during dry periods. According to the Agriculture Minister, the management of the system needed to be improved to give farmers the much needed support.